This is a traditional breakfast of South India. Poori's taste great when served hot and this is loved by all most everyone. In a bowl, mix flour and salt, add water little by little to make a dough. Finally add ghee and knead it well. (This dough must be little harder than the chapathi dough). Cover with a damp cloth and let the dough rest for atleast half an hour. Heat oil in a pan, and deep fry them to make soft , crispy poori's. Now let us prepare potatoes with peas masala. Heat oil in a pan, add cumin seeds and chopped onions, saute them until they turn translucent. Add the ginger-garlic paste , saute them until the raw smell extracts from it. Add potatoes along with turmeric powder, chilli powder and garam masala powder and mix them well. Now add the cooked peas along with salt and mix them gently . 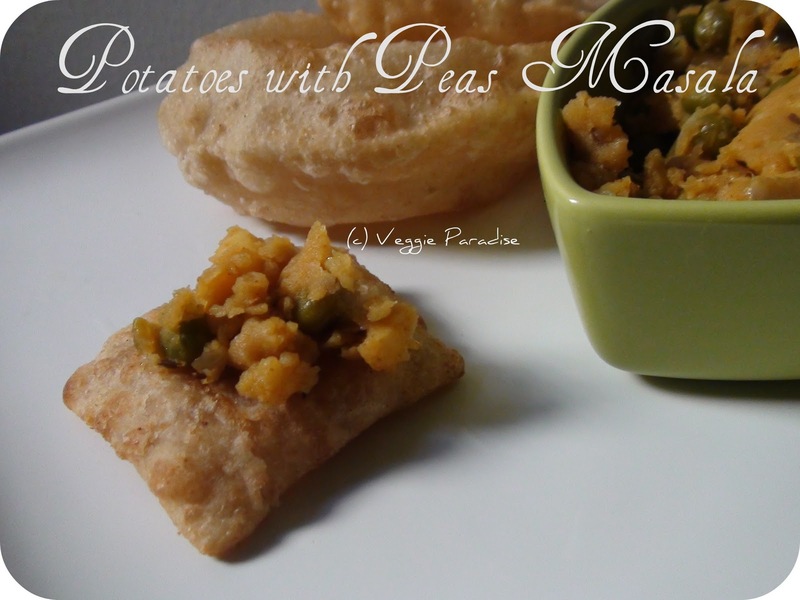 Potatoes Peas masala is ready to be served with Poori's. My favorite ! Looks yummy! 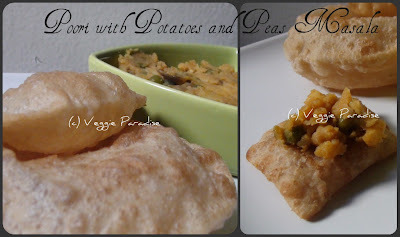 Great looking poori and potato curry aruna!!! Ideal combo!! My favourite breakfast ... making me hungry.. the pic looks lovely..
Great combination Aruna,this is my favorite recipe. looks lovely ..my perfect Sunday Brunch. love pooris and that looks perfect..
Lovely combo of puri potato,love the pictures..
Aruna, Morning here..Perfect for breakfast..good clicks dear..Came out perfect. 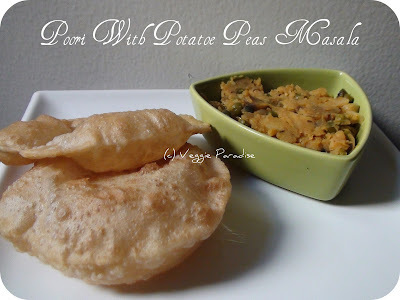 This is my daughter's fav...Very tempting poori and masala...Perfect! This is morning 8: 25 AM here in India and I feel like having the same preparation as yours for breakfast. Looks mouthwatering. my fav breakfast...looks yummy n perfect..
Square one is specially looking very nice! Lovely pictures...Love porri with this masala...beautiful presentation too!! 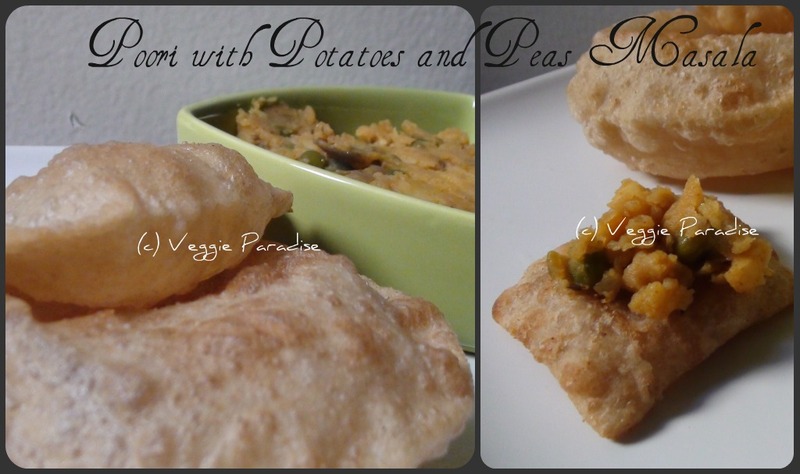 wow, those pooris look so tempting and specially topped with your curry, love it. My all time fav, looks too good to resist!! 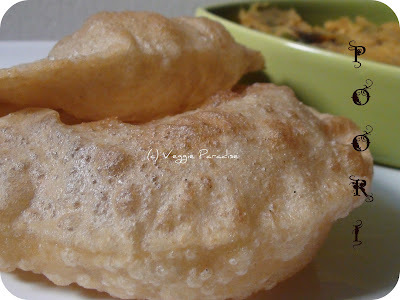 Feel like having those soft pooris and tempting masala,delicious..
oh I love how that just puffs up! All time favorite.. Can never get enough of Poori..
wow what a coincidence, today I made puris for dinner. Awesome pics and yummy..